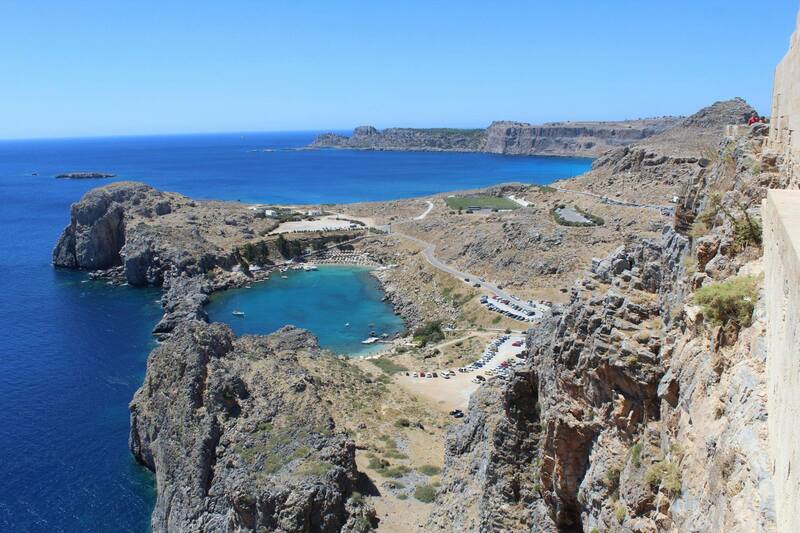 Saint Paul’s Beach is situated just about 1 km south of the small town of Lindos on the island of Rhodes. Lindos is a small pedestrian town declared by the UNESCO as World Heritage Site. Famous for its narrow streets and the seventeenth-century houses with mosaic paved courtyards. Near the town and the bay, there is the famous Lindos Acropolis that can be visited only on foot or with a donkey. There are two beautiful beaches in the bay made of golden sand and, of course, a breathtaking crystal clear sea. On the hill nearby there is a small church dedicated to Saint Paul where he is celebrated every 29 of June. It is a very popular wedding location for the amazing panorama that offers. The beach offers a beautiful panorama and it is sheltered from the wind which makes it very pleasant for sunbathing. This short stretch of coast is very warm, perfect for long days on the sun, snorkeling, diving and relaxing. There is also a refreshment area and the beach is equipped wit beach chairs and umbrellas. It is definitely one of the most beautiful beaches on the island of Rhodes which has some of the most breathtaking Mediterranean beaches and landscapes, so give it a look.